* Combine sugar, flour salt, cinnamon, and allspice in a medium bowl. * Add apples (set aside 2 Tablespoons of apple liquid) and stir to coat evenly with sugar mixture. 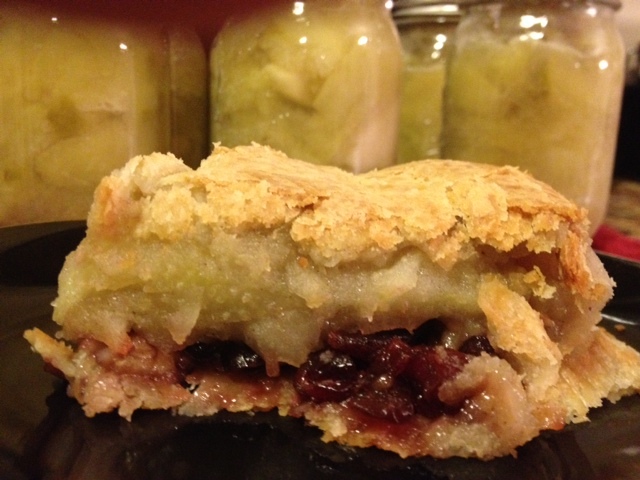 * Combine cranberries and walnuts in 2 tablespoons of apple liquid that was set aside from jar/can of apple filling. Let stand for 10 minutes. Here is where you can use your own pie crust or use a pre-made frozen one (like I did). * Evenly spread cranberry mixture over entire bottom of crust. * Spoon out apple mixture over cranberries. * Cut butter into small pieces and place evenly over the apples. * Center top crust over the pie and trim edge allowing 1/2 inch overhang. * Fold edge of top crust under bottom crust; flute the edge to seal. * Reduce heat to 350 degrees and continue baking for 15 minutes (or until crust is lightly browned and fruit is tender).